Berlin is located in the center of a system of waterways which covers all central East- and West-Europe. Till the 1950s more goods and material were transported here via rivers and canals and not via roads. With a new post-war transport policy this has changed and highways (Autobahnen) became the new traffic arteries. And where till the middle of the last century cargoboats and barges caused traffic jams on their way to the next inner harbour, today sightseeing boats with excited tourists on board are cruising Berlins rivers and canals. 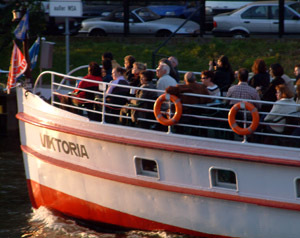 For you company-event in Berlin we organize exclusive boat-tours on Spree and Havel river. Allow your clients and business associates something special. We are able to provide you with ships in different sizes and standards – good for an afternoon sightseeing tour with well baked german cake and coffee or for your evening pleasure. We are happy to offer you e.g. 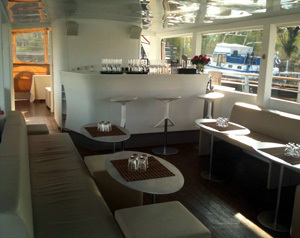 luxury boats to enjoy a high standard dinner onboard or a party till late in the night. Overview tours through the historical city-centre (1-3 hrs) with Nikolai Quarter, Museums-Island, Government Quarter, Bellevue Palace. Evening City-Cruises (2-? hrs. )- Enjoy Berlin by Night – an unforgettable experience! We plan your boat-tour according to your requests. For small groups we recommend e.g. small museums boats, like an old, carefully restored launch of the early 20th century, an italian style Rivabus or a modern furnished solar catamaran – also a large variety of sport boats and an original speedboat of the GDR borderguards. For big groups we recommend a typical Spree-steamship, cabrioships with removable glass roof or exclusive luxury liners, which leave nothing to be desired. 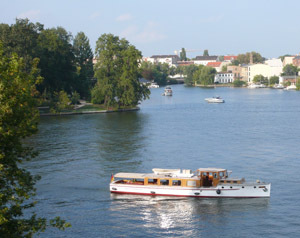 Our professional river guides have deep knowledge of Berlin/Potsdam and their waterways. 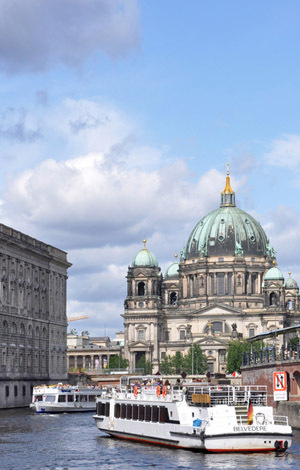 During your cruise they will explain life at the banks of Spree and Havel river in a well-informed and humorous way. We are able to offer you sightseeing tours in all popular languages. Naturally it is also possible to charter our boats without a guide, if you wish to have e.g. a business meeting onboard – we take care of discretion. Anything goes – from coffee and cake, via fingerfood to high quality buffets and menues. We will suggest you a few alternatives. During big events with a high number of guests we offer also a flatrate for beverages. Just ask for this. In Berlin city most of the piers are private or belong to different shipping companies. We always try to find a starting point which is suitable for your group. Optional we organize a bus-transfer e.g. from your hotel to the pier. Our private, individual boat-tours are very popular and for understandable reasons the number of ships on central Berlins waterways is limited. A good reason to book as early as possible. Short term bookings especially in high season are generally not possible. Enjoy with your guests an unforgettable time during one of our private cruises on Berlins waterways.